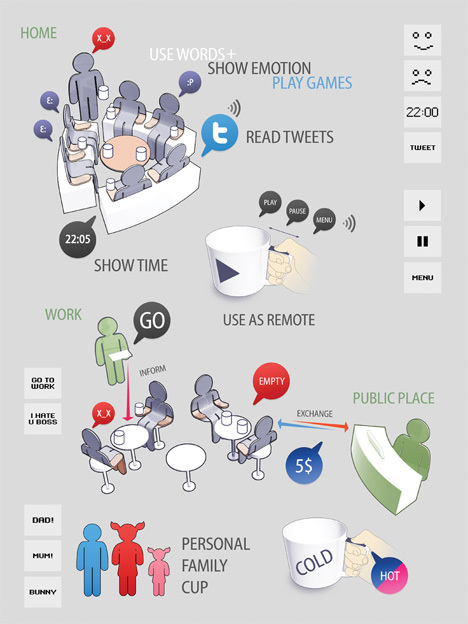 Are you fed up with Twitter, Facebook and FourSquare telling you what everyone you know is doing any any given moment? 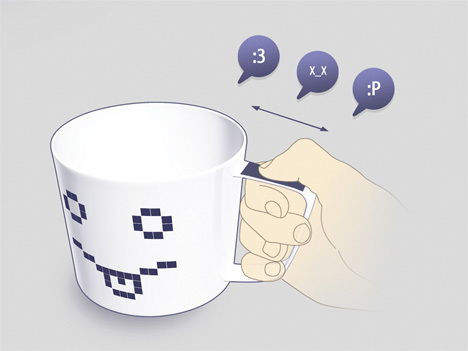 Then you may want to look away now, because the Smile Cup concept from Nikita Mokhirev will give your friends and co-workers an even handier way to keep you informed of their every movement. Created for the Fujitsu Design Award: A Life With Future Computing competition, organized by designboom in collaboration with Fujitsu, the Smile Cup would go absolutely everywhere with the user. 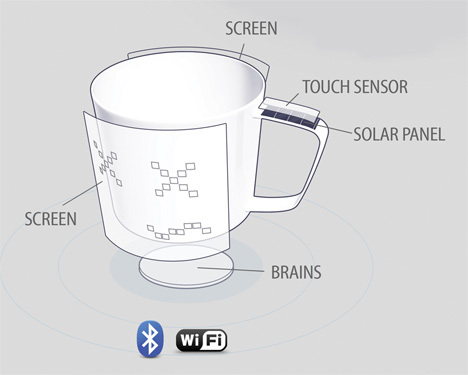 It might be the first coffee/tea mug with wireless capabilities. Both sides of the mug feature ultra-thin screens that allow the mug to be used like a small portable computer that you can drink coffee out of. The mug’s handle features a solar panel to keep it juiced up – the solar panel also doubles as a touch pad for controlling the mug’s functions. You can use the mug’s screens to display the time, pictures or even the price of the drink you’re consuming. It can send tweets, send and receive text messages, and let you check email. 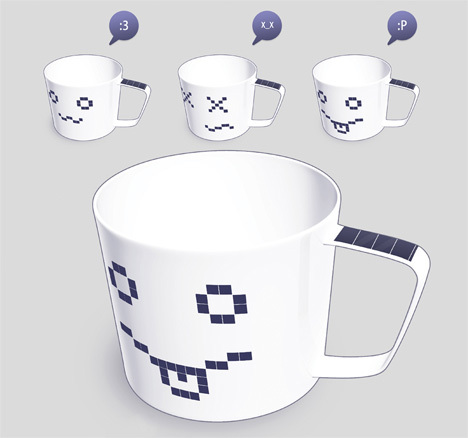 But our favorite Smile Cup function is the mug’s ability to display an emoticon on its side that tells the world just how you feel at that moment. If your cup is empty and you’re on your way to fill it up, a frowny face lets your office-mates know to steer clear. A giddy lovesick smiley tells your office crush that you’re interested but just don’t know what to say. Annoying and childish? Perhaps. But no more so than the passive-aggressive Facebook statuses everyone else in the office is posting. See more in Unbuilt Concepts or under Technology. June, 2011.